Yesterday I was browsing for chicken recipes and I found this yummy chicken recipe. 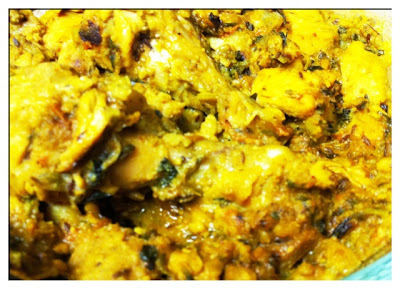 This is really awesome and I made it with little variation that is I just added methi leaves to the curry. Methi leaves a good for health and aloo methi combination rocks. Punjab is one of the northern state in India. This curry style originated from that place so the name. Remove extra fat from chicken and cut it to medium size pieces. Remove skin from drum sticks and make deep cuts. Wash them and allow water to drain completely. Now take a wide mouth skillet and heat oil in it. Add cumin seeds and when they start splattering add onions and green chili. when the onion turn tender add ginger, garlic, salt and turmeric and saute till raw flavor goes off. Then add Potatoes and mix well. cook by closing the vessel for 2min and keep sauteing in between. Then add coriander powder, cumin powder, curd, coconut powder and 1/2cup water and mix well. Let this cook under medium flame for 2min by closing the vessel. Now add chicken mix well and add more water if required and cook till chicken is completely cooked under medium flame. It takes about 15min to completely cook the chicken. When the chicken is done add methi leaves,and garam masala. Mix well and cook it under medium flame. Check for taste add salt if required, and also you can add water if you want more gravy like if you wish. After the curry is cooked garnish with cilantro and serve it. Goes well with bagara/ plain rice/chapati. Hope you like my recipe, please feel free to post your comments. They are very valuable for me, you can even subscribe by e-mail to my blog, the recipes will reach your inbox. ThanX for visiting my space. Please bookmark it to visit again. 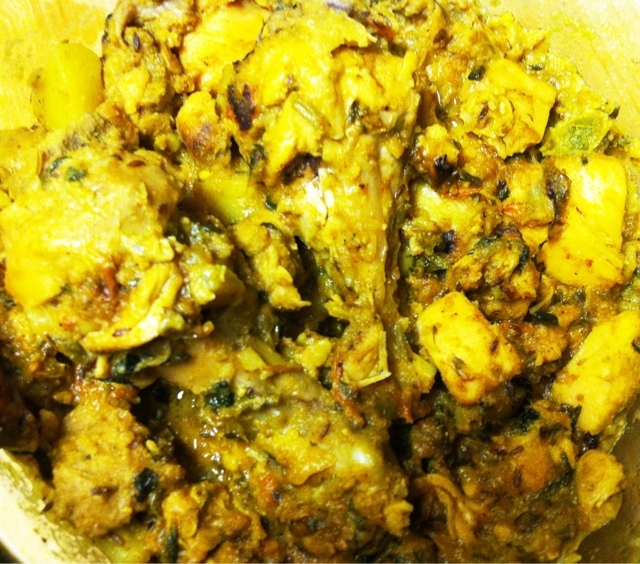 Yum yum, love chicken and potato combo in curry,super delicious dish. 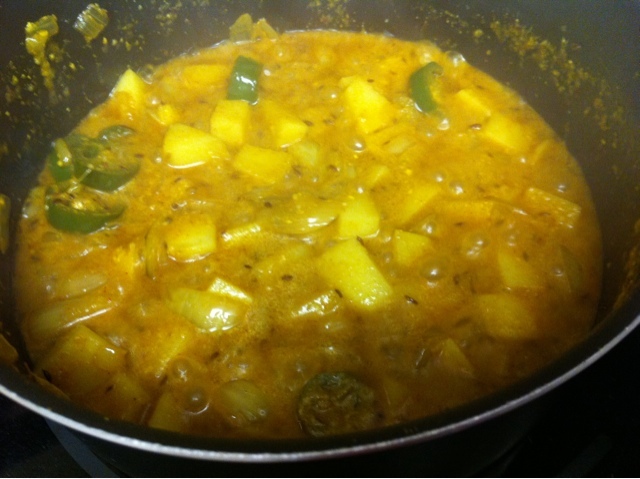 Panjabi style curry is delicious. Happy Diwali to you and your family Deepthi!! !